Hard Truths is an 85,000-word collection of interviews with the crime genre's most accomplished writers. As both an award-winning journalist and one of the most acclaimed crime writers of recent times Tony Black is uniquely placed to cross-examine crime fiction's bestselling authors. 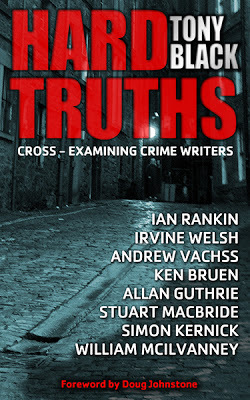 Names like Ian Rankin, Irvine Welsh, Andrew Vachss and William McIlvanney reveal the secrets of their craft in a series of interviews conducted over the last five years. Black takes an often no-holds-barred approach and pushes friendships to the limit as he teases out the truth on subjects as diverse as politics, the writing life, popular culture and personal histories. Always entertaining and often heartfelt these exchanges offer an entertaining, humorous and eclectic look at some of the genre's leading lights. "For anyone at all interested in crime writers and crime writing - hell, for anyone even vaguely interested in writing and stories - this is an indispensable collection, full of insight and revelation." "When I started, and for the first half dozen Rebus books, I got scant-to-no media attention. I could walk into Edinburgh bookshops and find the shelves bereft of Rankin titles; it was all more than a little depressing." "I never had that - well coming from my background you wouldn't - snobbishness that says you have to write literature. It's all books, and if they work they work and that's it." "Fiction often has a greater power to expose truth than non-fiction, especially given the extent to which journalism has degenerated." Find out more about Hard Truths over at Tony Black's Pulp Pusher. Oh, and Brit Grit Alley has a Facebook group, in case you didn't know. It's here. There'll be more carryings on down Brit Grit Alley next week,sorta kinda thing, like. Paul D. Brazill was born in England and lives in Poland. He is an International Thriller Writers Inc member whose writing has been translated into Italian, Polish and Slovene. He has had writing published in various magazines and anthologies, including The Mammoth Books of Best British Crime 8 and 10, alongside the likes of Ian Rankin, Neil Gaiman and Lee Child. He has edited a few anthologies, including the best-selling True Brit Grit – with Luca Veste - and his novella Guns Of Brixton will be out pretty damned soon. HE BLOGS HERE.